The Ebola fever epidemic currently raging in Guinea, Liberia and Sierra Leone is of an unprecedented scale. Since March this year, Médecins Sans Frontières (MSF) has treated more than 250 confirmed cases. MSF’s Dr Hilde de Clerck and MSF epidemiologist Dr Michel Van Herp both have extensive experience in containing haemorrhagic fever outbreaks. They have helped respond to six Ebola outbreaks, notably in the DRC, Uganda and most recently, Guinea. Here, they talk about the current outbreak and the challenges facing MSF teams battling to contain its spread on the ground. We are currently seeing a resurgence of the Ebola epidemic in West Africa, in Guinea in particular. What is the current situation? Hilde de Clerck: Just a few weeks ago, there were only two villages left in Guinea that MSF still had to monitor for ‘contact’ people – anyone who had been in contact with confirmed or suspected cases of Ebola. As a result, we were quite hopeful that we were witnessing the end of the epidemic. But then, all at once, we received calls from three different sites in Guinea. Within five minutes, everything had changed. It emerged that several cases had also appeared in villages in neighbouring Sierra Leone that are very close to the Guinean border. For the people here, the border doesn’t exist in the way that many might imagine a border would. Here the border - is porous, and people regularly cross back and forth. They have family on both sides and they frequently travel to markets, or to funerals, for example. In addition to the alert for those villages in Sierra Leone, there were also new alerts inside Guinea - in Télimélé, a mountainous region 200 km north of the capital, Conakry, and also in the capital itself. All these new alerts together meant that in the Guéckédou region alone, one of the most affected areas in the south of Guinea, MSF went from monitoring only two villages to needing to monitor 40 villages and more than 500 ‘contact’ people. When you carry out epidemiological analysis using records of the ‘contact’ people you can see where cases are likely to appear. There are many villages affected. This has now become the largest epidemic we have ever faced, in terms of its duration and the numbers of cases. Why is the epidemic so difficult to control? Michel Van Herp: Lack of knowledge amongst the population about Ebola, the high mobility people in this area of the world, and the wide geographic spread of cases, all combine together to make it difficult to control this epidemic. It is the first time that Guinea, Sierra Leone and Liberia have had to deal with the Ebola virus. People are afraid and find it difficult to believe that the disease even exists. The communities here are not familiar with this disease, so we work with anthropologists as part of our outbreak response. These anthropologists work/try to help us better understand the populations here and to facilitate our relationships with patients and communities. With a mortality rate as high as 90%, when people hear of Ebola, they immediately think of death. This generates intense levels of fear, and for some people here, Ebola is perceived as something akin to magic. This fear and superstition is understandable if you think about how patients with cancer in western societies sometimes cope. For example, sometimes cancer patients refuse to accept their diagnosis in order to try to avoid the consequences of what that diagnose means. The high level of population mobility is another aggravating factor in the spread of the disease. People in these areas of West Africa are more mobile than those MSF had treated in previous Ebola outbreaks in Uganda or the Democratic Republic of the Congo. For instance, one patient we treated had travelled through five villages in a single week before coming to our treatment centre. This means that he would have infected other people in each of those villages he passed through. What impact could the lack of trust among the population have on the effectiveness of the resources deployed to slow down the spread of Ebola? Hilde de Clerck: In Macenta (Guinea), one family lost 15 people to the Ebola virus. MSF was able to treat the head of the family and his wife, who both survived. As a result, we were confident that those two successfully treated parents would then have a lot of influence on the rest of the family about the critical need to seek treatment immediately if anyone experienced Ebola-like symptoms. Yet, a few days later, a small boy from this same family fell ill. His aunt fled with him to another village and the child died a few days later. Often, convincing one member of the family is simply not enough. To control the chain of disease transmission it seems we have to earn the trust of nearly every individual in an affected family. This is a mammoth task, which is why greater involvement from the religious and political authorities in raising awareness about the disease is crucial. Today, we face the hostility of the population in some areas. There are still 20 villages around Gueckedou that continue to deny access to medical teams, but we will continue dialogue with the local authorities to try to change this. Accurate information about the disease needs to be rapidly and widely spread across the affected countries. This is essential in order to combat the fear surrounding this disease, but also to increase awareness about several things: the need for people to come for treatment quickly; to not travel and put themselves in contact with other people if they suspect they might be infected; and the proper way to conduct the funerals of those who have died from the disease. Disseminating reliable information is only part of the battle to contain this outbreak. Patients and communities ¨will also need to fully accept that information. Spreading knowledge and instilling trust among the population will be vital if we are to control the chain of virus transmission. Do we know the source of the epidemic, the index case? Michel Van Herp: The epidemic seems to have originated in a village near Guéckédou in Guinea, from where the disease then spread out. It is a place where people do a significant amount of bat hunting. Just as many other families living in that area, the first family in the village to be infected with the disease admitted to having hunted two species of bat. These were Hypsignatus monstrosus and Epomops franqueti, which both carry the Ebola virus. Bat colonies migrate across vast distances and we think that they first pass the virus amongst themselves, thereby passing it from the east to the west of Africa. The Ebola virus is then introduced into the population if they come into contact with infected animals. The increase in virus transmission in Sierra Leone also seems to have had a connection to the social status of the source of infection – to the social status of an ‘origin’ case. In Sierra Leone the fact that a healer in the community was infected meant that the disease spread quickly. For funerals, deceased people are usually washed and then clothed, as is also customary in western societies. However, even after death, the Ebola virus remains present in the body of the deceased and any contact with that body can result in an infection. Given the importance of this healer in the social structure, several people were infected while attending his funeral. This is in stark contrast to what happens if a child falls ill – the sick child will normally only infect a few people. However, a mobile adult, with a big community role, will have contact with far more people, thus spreading the disease further. Thus, the social status or social role of an infected person in traditional society is another critical factor in virus transmission. What are the main challenges that still need to be addressed? Hilde de Clerck: With the significant increase in new infection sites, MSF must now spread its teams across many more areas. MSF has experienced staff, but not an infinite supply – there are a limited number as we are also working in other emergencies around the world. MSF teams are working in many locations to help contain this outbreak, including: monitoring contacts, epidemiological surveys, health promotion, patient and community counselling, quarantine, medical care provision, running ambulances, disinfection of houses, and burials. Other stakeholders help carry out parts of these tasks, but these teams are also small and do not always have the necessary experience. There is now an urgent need for all actors to increase the number of human resources that can be made available to deal with this emergency – especially experienced people. It’s more about experience than medical sophistication in trying to contain this outbreak. While the work our teams to help contain Ebola is not very sophisticated in medical terms, there are, however, very strict procedures that absolutely must be followed to avoid putting people in danger of infection. Ideally, to increase human resources on the ground, two-person teams would be trained with one experienced person for a week or two, or longer if possible. What difficulties do the MSF teams face in treating an emergency like this? Hilde de Clerck: Apart from the enormous workload, it is extremely challenging both physically and emotionally for our staff. Outreach teams often travel long journeys to reach affected communities. Many also know the affected families themselves and are witness to heartbreaking moments when people must be taken from their family or community into the treatment centre. Teams working in the treatment centres must all wear full-body plastic scuba protective gear, which is intensely uncomfortable and difficult to bear in such high temperatures. As there are many patients, we must be careful to avoid hyperthermia and dehydration. Emotionally, this work is quite extreme. Many patients die, including children. Palliative care for this disease is tough, as patients are terrified. We comfort patients whenever possible. We are the last people to touch them, and many of them ask us to hold their hands. These moments are both difficult and emotionally intense. Even if it is an emergency, we try to be as humane and as gentle as we possibly can. Does an unprecedented epidemic call for unprecedented measures? 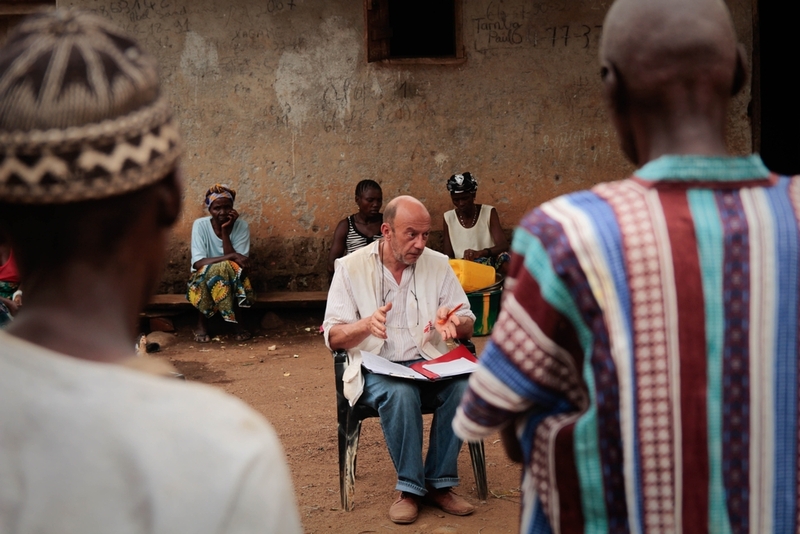 Michel Van Herp: The increase in the number of sites has stretched MSF to the limits of our available human resource. We now have 300 staff working to try to contain the outbreak. We need to keep the focus our medical teams on the medical care, and the quarantining work, as MSF is one of the only stakeholders with the technical expertise, especially in terms of quarantining patients. For this to be possible we absolutely need others to take over some of the other tasks we are also carrying out, so we can really prioritise the medical aspects. Thus, we need other actors that specialise in awareness raising and community ‘contact’ monitoring to really increase their activities. A major challenge is monitoring cross-border contacts and coordinating the medical response.